As the connected vehicle trend grows, demand for durable electrical and electronic systems grows with it. Applications such as in-vehicle navigation, infotainment and electric and hybrid drivetrains require lots of new connections. Likewise, advanced vehicle safety features—such as anti-lock brakes, stability control and tire-pressure monitoring—are growing fast. As a result, automotive OEMS need cost-effective strategies for designing and assembling new electrical and electronic systems. As a result of this new industry trend, many are turning to press-fit connector technology to augment and replace solder joints. A press-fit connection, which is highly reliable, includes an elastic pin and a plated through-hole (PTH). The PTH is drilled into a layered circuit board that is electroplated, typically with copper, to create the circuit on insertion of the press-fit pin. Not just any press-fit connector will do, however. A standard press-fit connection cannot provide the higher ampacity or the resistance to vibration, thermal shock and environmental conditions that automotive applications require, but advanced press-fit connectors have addressed these issues. 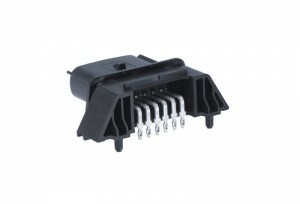 Available in a range of sizes, shapes, patterns and pitches, a press-fit connector may comprise a single pin or any number of pins. Press fit pin connections are versatile and can be used on both sides of the PCB, which enables flexible, double-sided through-hole and SMT PCB assemblies. Also, as modules for engines and transmissions shrink in size, press-fit pins can help protect sensitive components and save valuable space in tight pin configurations. Another advantage of press-fit over wave-soldered connections is thermal compatibility. If secondary soldering is required, it will introduce heat that can damage the PCB and attached electronics. Press-fit technology entirely eliminates the extra heat cycle and allows secondary connections using only force for assembly. Similarly, many automotive systems and components generate heat, which can build up in the engine compartment. Press-fit pins provide a reliable interface that naturally dissipates thermal heat, with a significantly higher heat threshold and lower failure rate than solder joints. When migrating from wave-soldering to press-fit, it is important to work with an experienced supplier. For example, many factors can affect press-pin force resistance, and even a minor change in plating diameter can have a huge influence on insertion and retention force and spell the difference between recurring critical faults and a high-performance connection. Knowing the best way to apply press-fit connections helps make sure they are a good fit for your application. Five Reasons to Replace SMT Mezzanine Connectors with the NeoPress* High-Speed System Designers typically sacrifice flexibility and cost savings when they use SMT connectors on PCBs. But the NeoPress™ High-Speed Mezzanine System makes that sacrifice unnecessary.